Junie B. Jones has all the answers when it comes to cheating. It's just plain wrong. But what about copying someone else's homework? That's not cheating, right? Maybe this cheating business is more complicated than Junie B. thought. Could she be a cheater pants and not even know it? 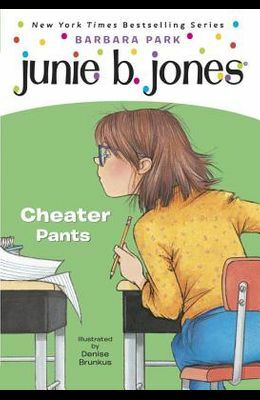 From the front Cover Junie B. Jones has all the answers when it comes to cheating. It's just plain wrong!But what about copying someone else's homework? That's not cheating, right? 'Cause homework isn't even a test! And speaking of tests . . . what if a friend shares an answer that you didn't even ask for? Sharing definitely isn't cheating . . . is it? Uh-oh. Maybe this cheating business is more complicated than Junie B. thought. Could she be a cheater pants and not even know it? From the Hardcover edition.